We carry a wide variety of reclining power lift chairs by Windermere, a Pride Mobility Company™. 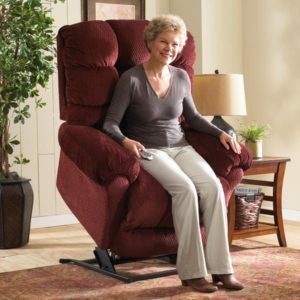 We also offer reclining power lift chair models from Best Home Furnishings, Lane Furniture, and Catnapper. These chairs are designed to assist people needing help standing up from or sitting down in their recliner chair. Reclining power lift chairs come with comfort coil seat cores for added support and years of use. For your added convenience and comfort in the event of power failures, they also come with a battery backup feature as well as an optional rechargeable battery pack with a smooth, quiet motor. The optional rechargeable battery pack is also useful when a power outlet is not nearby. Some models even have heat and massage! For your peace of mind, the steel mechanism is covered by a limited lifetime warranty.